In this optimistic and inspiring book, Peter Whybrow, the prize-winning author of American Mania, returns to offer a prescription for genuine human progress. 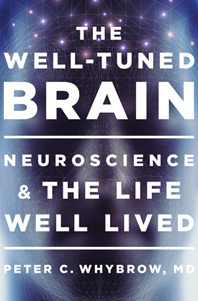 The Well-Tuned Brain is a call to action. Swept along by the cascading advances of today’s technology, most of us take for granted that progress brings improvement. Despite spectacular material advance, however, the evidence grows that we are failing to create a sustainable future for humanity. We are out of tune with the planet that nurtures us. Technology itself is not the problem, as Whybrow explains, but rather our behavior. Throughout its evolution the ancient brain that guides us each day has been focused on short-term survival. But fortunately we are intensely social creatures. Without the caring behaviors that flow from intimate attachments to others, we would be relying on a brain that is only marginally adapted to the complexity of the problems we must now face together. Today we must grapple with survival, not in its immediacy but over the long term. The first step in finding our way forward is to reexamine who we are as creatures of this planet. To this end, Whybrow takes us on a fascinating tour of self-discovery, drawing extensively upon his decades of experience as a psychiatrist and his broad knowledge of neuroscience and human behavior. Illustrated throughout with engaging personal stories, the book’s trove of cutting-edge science is enriched by philosophical, historical, and cultural perspectives. What emerges is a summons to rediscover the essential virtues of earlier nurturing, of mentored education, and an engagement with the natural world through curiosity and imagination. Neuroscience can open the search for a better future. But technology alone will not save us. To achieve success we will need the strength and wisdom of our better nature as humane social beings.